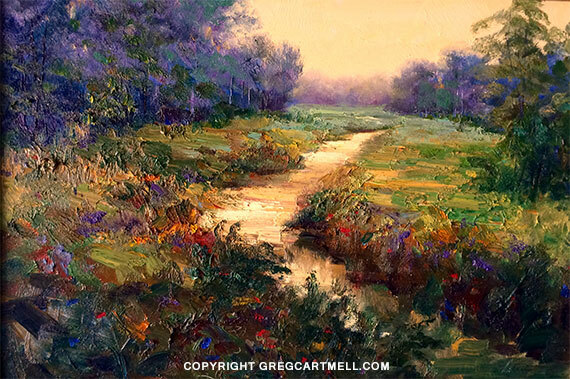 This is a landscape oil painting that I had started as a sketch in my notebook on location in Macomb, Mississippi. I later finished this in my studio from memory. It was a beautiful day when I did the sketch. The piece has been sold and is no longer available. I am always on the lookout for some sort of creek or river, and they make up well over 50% of my subject matter when it comes to my landscapes. I took a nice drive one day and came across a Macomb Mississippi creek that was calling my name! If you’re not familiar with where Macomb, Mississippi is located, it’s about 80 miles south of Jackson, MS and has a population of about 14,000. I saw this creek very early in the morning in Macomb, Mississippi while venturing around. There was a fog over the land and the morning light softened everything with a beautiful glow. I didn’t have time to do this piece, but made notes and a small sketch as fast as I could,to capture the light. Later that week I painted this from memory in my studio. I used a lot of impasto paint, so the paint is rich and thick in the foreground. I did so in order to help create the illusion of distance. In my opinion, it was a success.